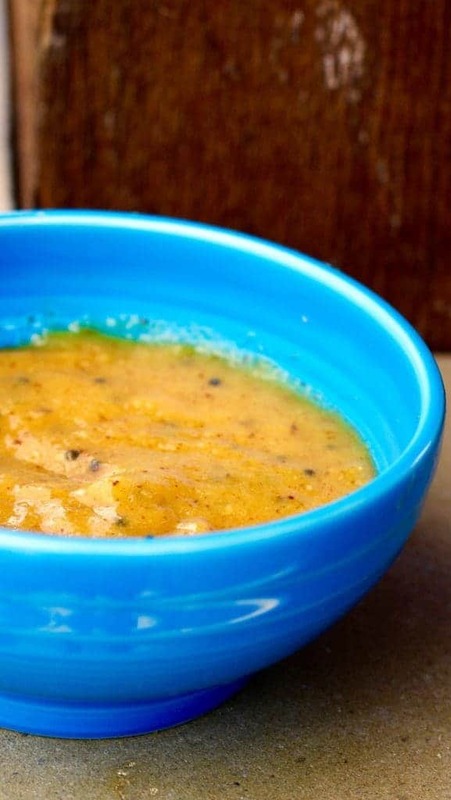 This Mango Onion Chutney is another Indian dish that I’ve never eaten outside of India. In fact, I’ve never even had it outside of our house as restaurants don’t even make it. It’s the simplest of things. Blend together some unripe/raw/green mango and some onion, add a few spices, temper with hot oil and mustard seeds, and you’re done. 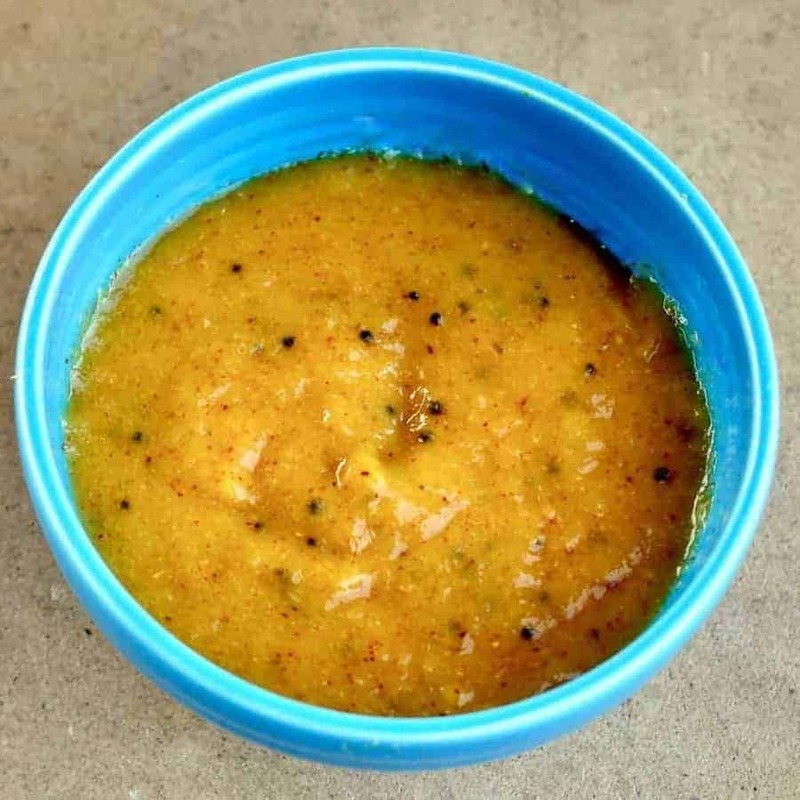 I meant to make this Mango Onion Chutney with one of the two raw mangos I bought when I make the Mango Panha, but I got distracted by a shiny object, actually several, and by the time I got around to it the mango was somewhat ripe. Traditionally this is made with tart, unripe mangos, but it worked this way as well. I used a blender because my hands sometimes bother me with my rheumatoid arthritis, but you’re meant to grate the onion and the mango rather than blend. So just do what works for you. There’s an ingredient in here we’ve not used before which is very prevalent in Indian cooking, and that’s the black mustard seeds. If you don’t have these or choose not to get them, just use whole cumin seeds instead. Other than that, you should have everything needed. LOOKING FOR MORE UNIQUE INDIAN RECIPES? CHECK OUT MY INDIAN SOOKHA KALA CHANA RECIPE! This delicious Indian Raw Mango Onion Chutney is a mix of unripe mangos, onions, & spices that tastes like you spent hours on it, but only takes 15 minutes! Peel and grate the mango and mix with the onion. Add the sweetener, cayenne, cumin and salt and taste. You want a good mix of hot, salty, tart, and sweet. Since mangos vary in their tartness, adjust as needed. In a small saucepan or heatproof ladle, heat the oil and when it is hot and starts to shimmer, add in the mustard seeds and let them pop. This classic tempering technique allows the mustard seeds to bloom in flavor and also flavors the oil. Once the seeds have sputtered for a bit (about 10 seconds), pour the flavored oil onto the chutney and mix well. Let the flavors marinate for about 10-15 minutes and serve with Indian food, fish, or grilled meat. This would also be a great dip for sweet potato fries. Hi, what is the shelf life of this chutney?? oh yum! I’m glad you guys liked it. Thanks for letting me know. Love the simplicity of this recipe. Do you typically serve it with chicken?